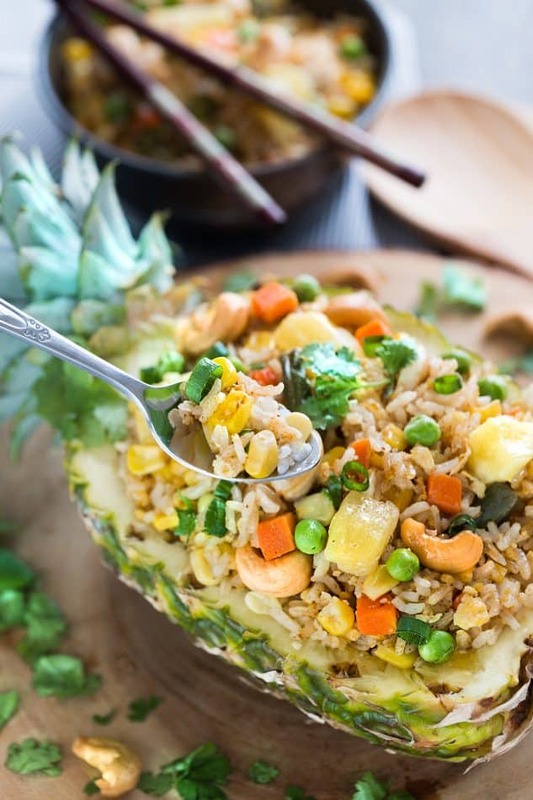 Pineapple Fried Rice – an easy recipe that is perfect for busy weeknights. Best of all, this simple side dish comes together in less than 30 minutes with chicken or shrimp & is SO much better than takeout! 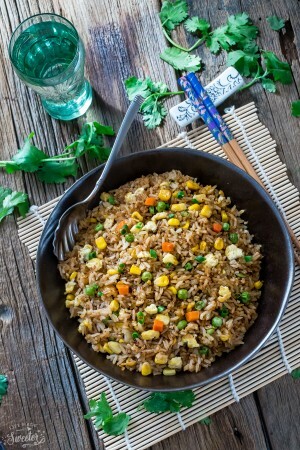 Fried Rice is one of those dishes I turn to the most when I don’t feel like fussing over dinner after a long day. It cooks up in just one pan – and the variations are endless with just a few simple ingredients. The best part is, it’s the perfect way to clean out the fridge with those lingering veggies. 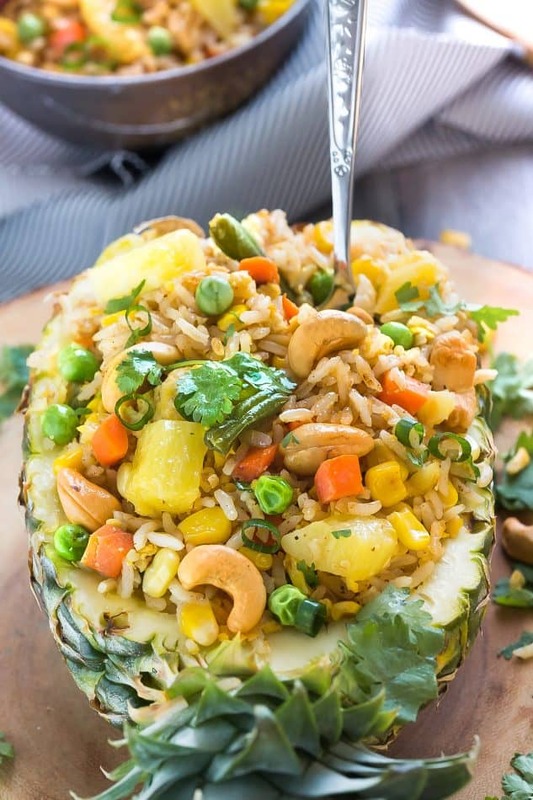 Pineapple Fried Rice happens to be my absolute favorite. 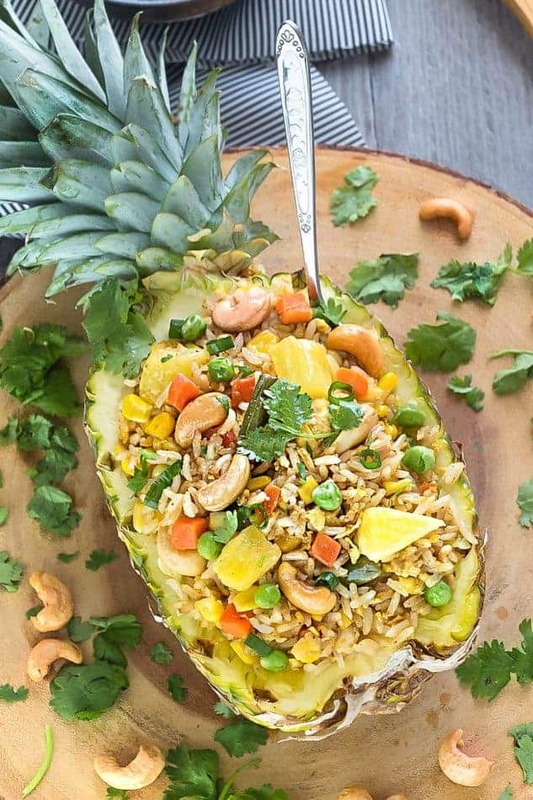 I am crazy over anything with pineapples and love adding it to dishes to give it a tropical sweetness. 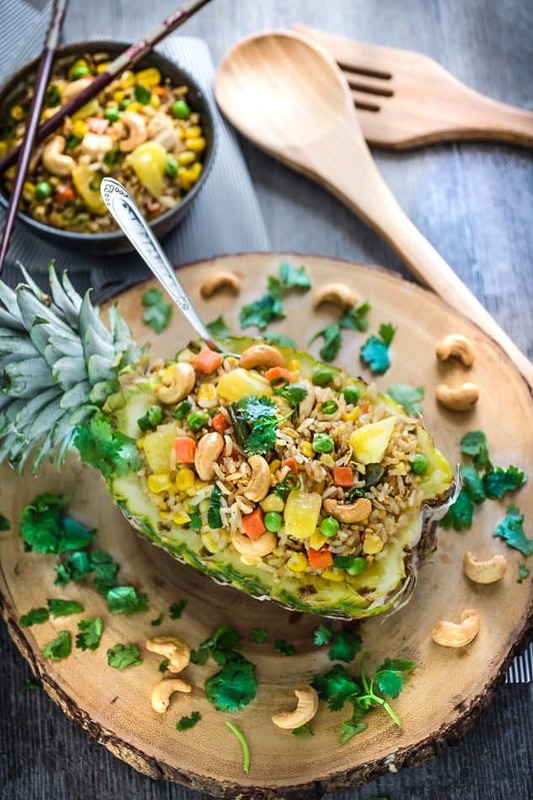 This Pineapple Fried Rice recipe is another variation from my cookbook. I’ve included some tips to make it gluten free and a little bit more allergy-friendly. I’ve also left out the curry powder that you find in most Thai restaurant versions. However, if you’re as crazy about Thai flavors as much as I am, you can totally add a bit of curry powder to kick it up a notch though. Cook the ingredients separately. In this recipe, you’ll cook the egg first, then dish out to plate. This is to ensure that each ingredient is perfectly cooked (not over or under cooked) AND that each ingredient maintains their distinct flavor and texture. 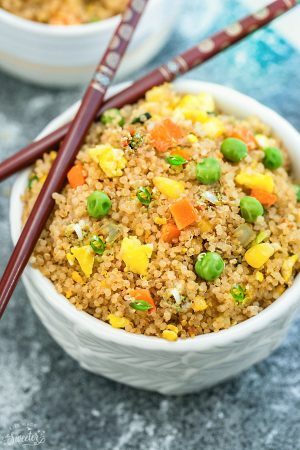 Add any protein you like – chicken, shrimp, tofu etc. To make-ahead, you can chop chicken, pork or beef into bite-sized pieces and store in a zip-top bag the night before. Heat 1 tablespoon of oil in a wok or large pan over hight heat. Add the onion, garlic and ginger and cook for a minute, until fragrant. Add the mixed vegetables and sauté for another 30 seconds - 1 minute. Push the ingredients to one side and pour in the beaten eggs. Scramble into small pieces until cooked. Transfer the ingredients to a large plate. Return the pan to the heat and add 1/2 tablespoon of oil. Add the pineapple and cook until slightly softened. Transfer to the same platter as the vegetables and eggs. Return the same pan back to the heat and add the remaining oil. 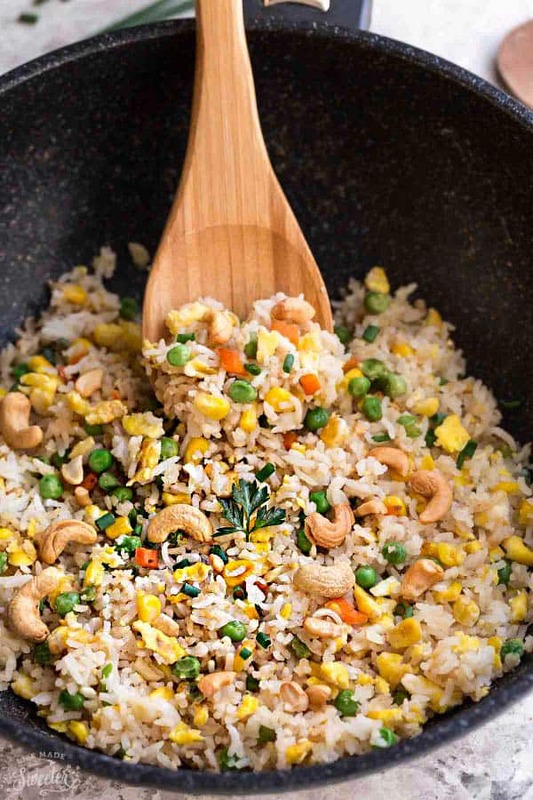 Spread the rice into the pan, breaking up any large chunks with a spatula. Cook until slightly toasted. Add the platter of vegetables and pineapples back into the pan. Add soy sauce, fish sauce (if using), sesame oil, Mirin, chili pepper flakes, salt and black pepper to taste. Sprinkle in the cashews and squeeze in the lime wedge and continue tossing and stirring well to combine everything. Serve hot with cilantro, green onions and sesame seeds, if desired. Add in chopped cooked chicken, shrimp, tofu or any other protein of your choice to make this a complete meal.